You rock up to a venue for a site inspection and you’re shown two, maybe three, dedicated ceremony locations. You wander around the grounds and ask about a few other spots when you’re told “No, you have to choose between spot A or B” – sound familiar? At Tangalooma, they’re all about flexibility. You can literally wake up on the morning of your wedding, point to a beautiful patch of grass or sand and say “I want to get married there”… and they’ll take care of it for you. And with picture-perfect stretches of pristine beach, palm-dotted gardens and mountainscapes all on offer as your backdrop, you’re spoiled for choice when it comes to dreamy settings. Keeping things flexible from the get-go, Tangalooma offers a range of wedding packages that can be tailored to you. We’re not talking just swapping a chicken dish for a seafood option – the venue’s helpful wedding coordinator can customise everything to suit your tastes. Want to celebrate tying the knot with an esky full of ice-cold Coronas under a canopy of swaying palms right after the ceremony? They’ll make it happen. Want to go all-out with roving canapés and Champagne under the stars? They’ve got you covered. Thinking of topping everything off with a roaring bonfire on the beach? That’s their speciality. However grand or laid-back you want to keep things, they’ll work with you to create your unique vision… with a little professional help, of course! 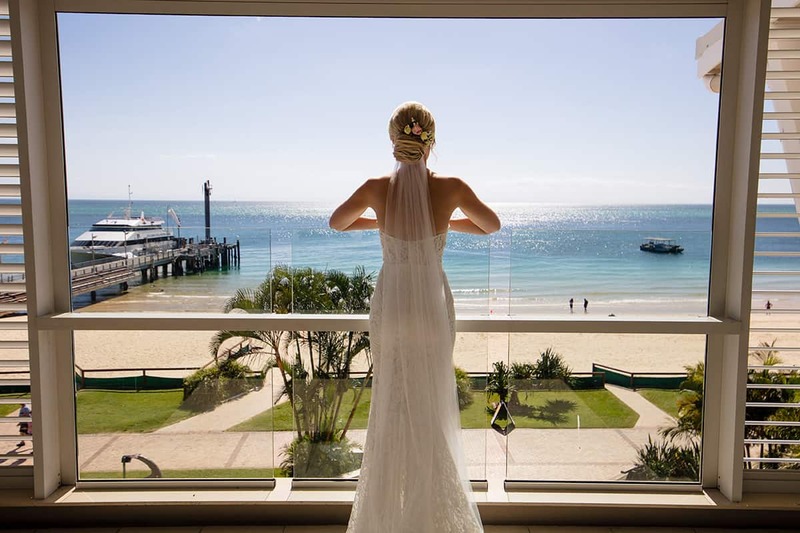 Making the most of its gorgeous setting, Tangalooma offers couples an array of incredible reception options that are pure beach wedding goals. 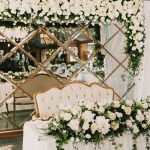 A much-loved option, the venue’s spacious Waterfront Pavilion Marquee is wonderful for adding a little timeless elegance to your special day. Situated right on the waterfront, the pavilion’s walls can open up to welcome in sigh-inducing Moreton Bay views and relaxing breezes. One last lovely touch? With a manicured lawn area and private gazebo, it’s ideal for creating a glamorous garden-party-meets-beach-reception atmosphere. Couples seeking something a little more contemporary will love the venue’s newly built Wheelhouse function space (above). With an intimate restaurant feel (while still holding up to 150 seated guests and 200 for cocktail parties), the space features unrivalled water views from its elevated position, plus fabulous heritage-inspired architectural touches. But the real stand-out feature is the rooftop deck that seems to blend into the blue beyond. Cocktails at sunset, anyone? Always pictured your special day with a reception on the sand? 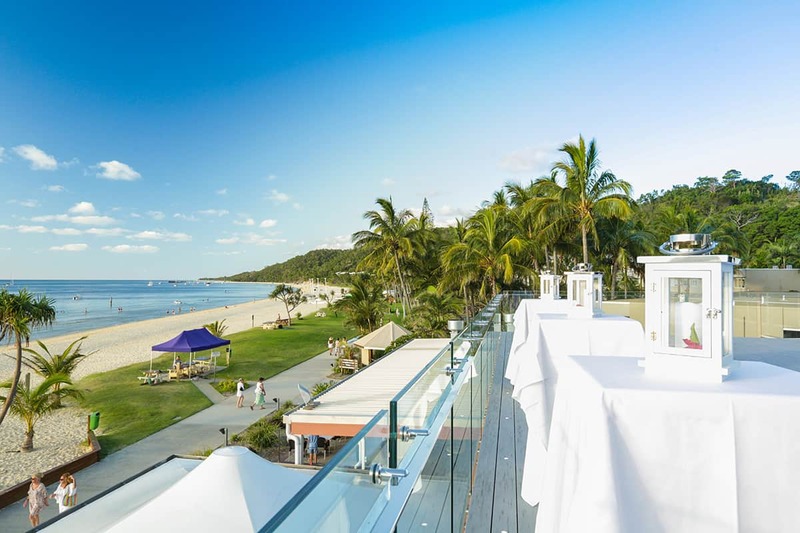 Blessed with an absolute beachfront location, Tangalooma also provides the perfect setting for a fantastic party on the beach. 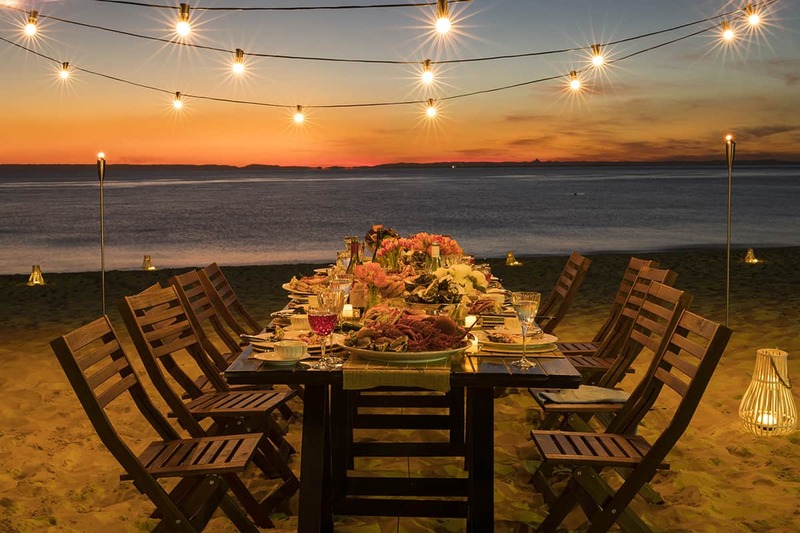 Think long tables by the water, with a casual area set up by a giant bonfire (the venue is one of only a few in Queensland with permission to host a bonfire reception). One word – heaven. 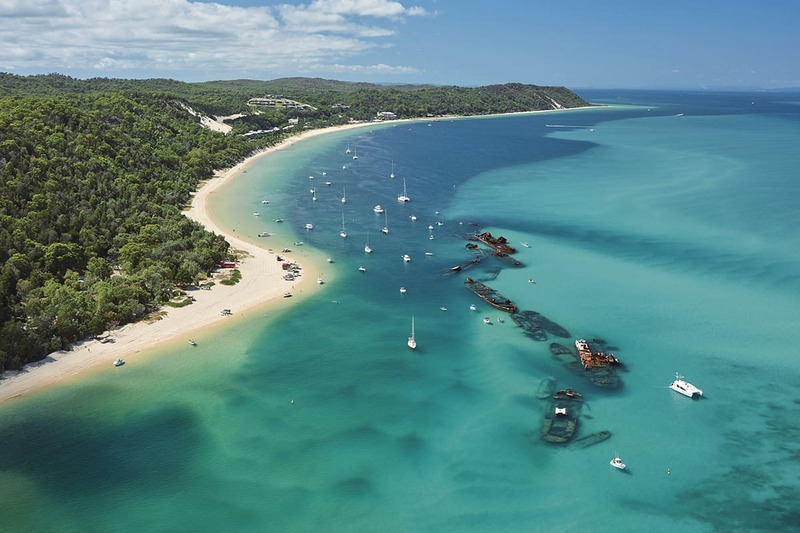 Of course, one of the main attractions of Tangalooma is its spectacular natural beauty. Crystalline waters that fade into deep blue, sugar-white sands, jade mountains and pink sunsets – it all comes together in this oasis. Sure to impress guests, the island’s proximity to Brisbane means you can also spot the city and the magnificent Glasshouse Mountains over the dazzling water. 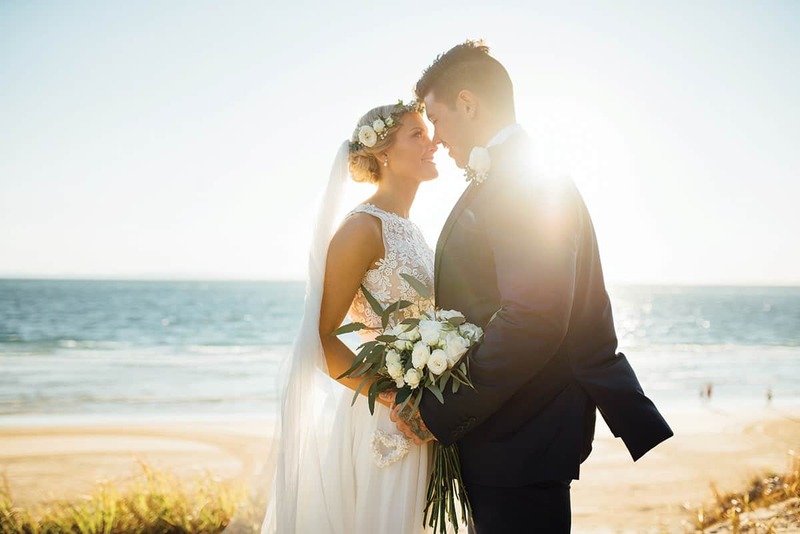 Needless to say, Tangalooma lends itself to unforgettable celebrations and enchanting post-ceremony photo sessions. Sounds perfect to us! The last thing you want on your wedding day is a missing-in-action events team. 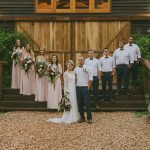 Tangalooma reserves only one wedding per day, meaning their professionals can focus on just you, your sweetheart and your guests. It’s okay to want to have the attention for yourselves on your wedding day! Just saying. The beauty of exchanging vows at Tangalooma is the venue’s chilled ‘summer holiday’ vibe. It may be called a resort, but nothing here is fussy. 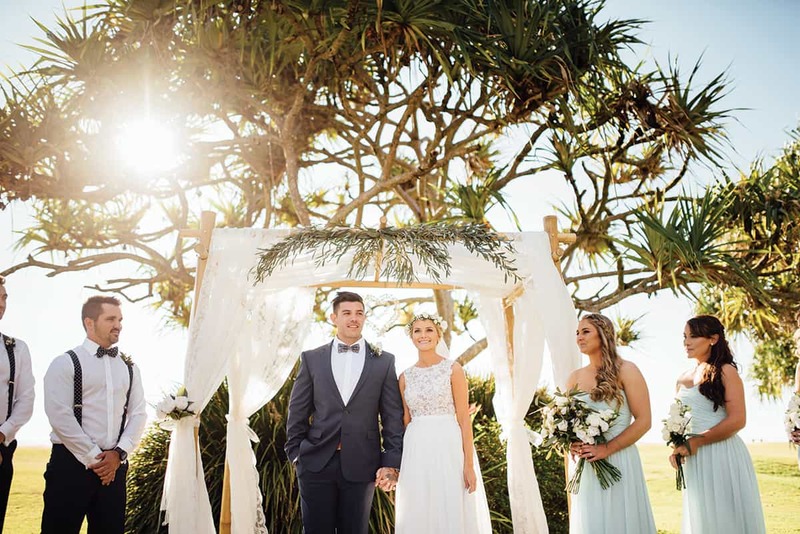 A cherished holiday destination for generations of Brisbane locals, Tangalooma still has a fun, summery vibe that keeps things blissfully relaxed – just what an island wedding calls for! 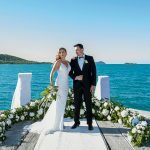 You don’t have to fly overseas (and ask your guests to fork out for airfares) for a wed-fest in paradise when you tie the knot at Tangalooma. Just 75 minutes’ ferry ride from Brisbane (a scenic journey that will create that ‘getting away from it all’ feeling), the island boasts all the essentials – plenty of accommodation and dining options, plus a seemingly endless list of once-in-a-lifetime experiences. 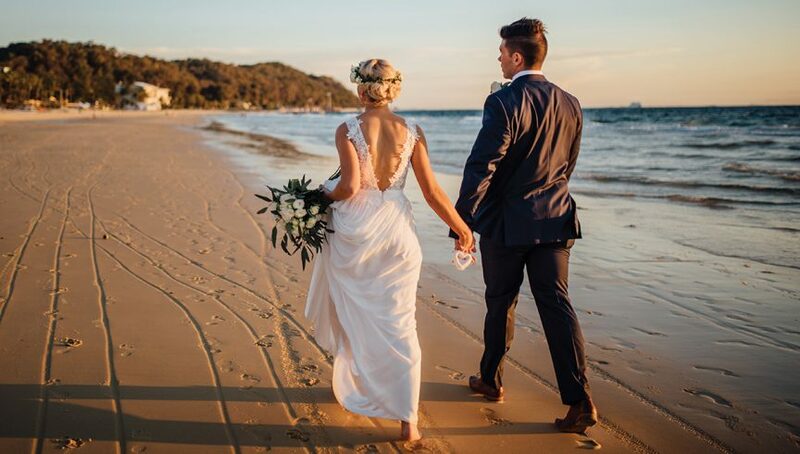 Whether for a pre-wedding catchup or to round out the whole wed-fest experience, Tangalooma’s range of water- and land-based activities will make your wedding truly memorable for all the right reasons. 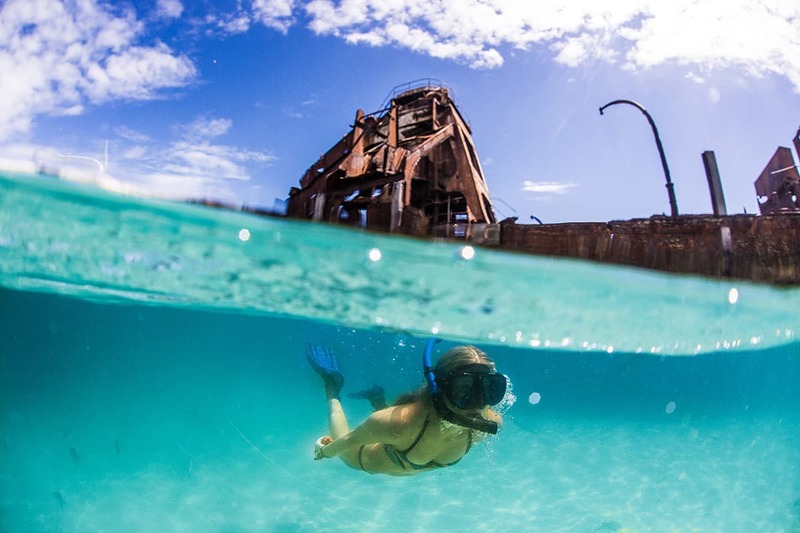 A real must-do, discovering the island’s iconic shipwrecks and marine life on a snorkelling adventure will have everyone grinning from ear-to-ear. Or, for the adrenalin-junkies, there’s ATV quad bike tracks over giant sand dunes and through bushland to explore – definitely don’t miss this! Want to mix romance with a little white-knuckle action? 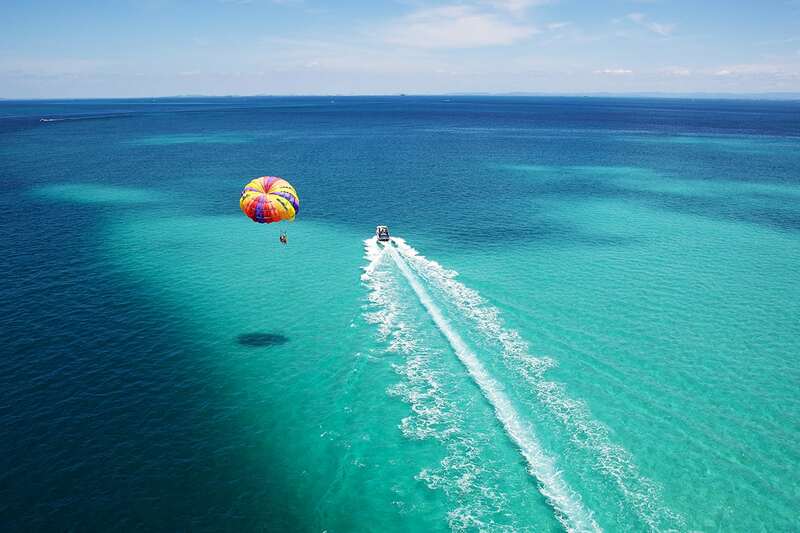 Parasailing will get your heart racing and will reveal some of the island’s most sensational views. Sigh. 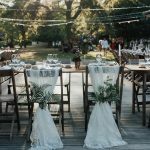 As soon as you say the words ‘destination wedding’, your guests are probably going to start thinking about the challenge that is finding affordable accommodation. Tangalooma can suit a range of needs, with seven styles of accommodation available – from comfortable budget rooms to family suites, holiday apartments and luxurious, self-contained beachfront villas. Also, guaranteed to get you into your guests’ good books, Tangalooma offers discounts for guest accommodation. No need to go scrolling through Google to find a bed for the night! Whether its a delicious wedding cake or a hilarious best man’s speech, there’s always something that everyone remembers from a wedding. 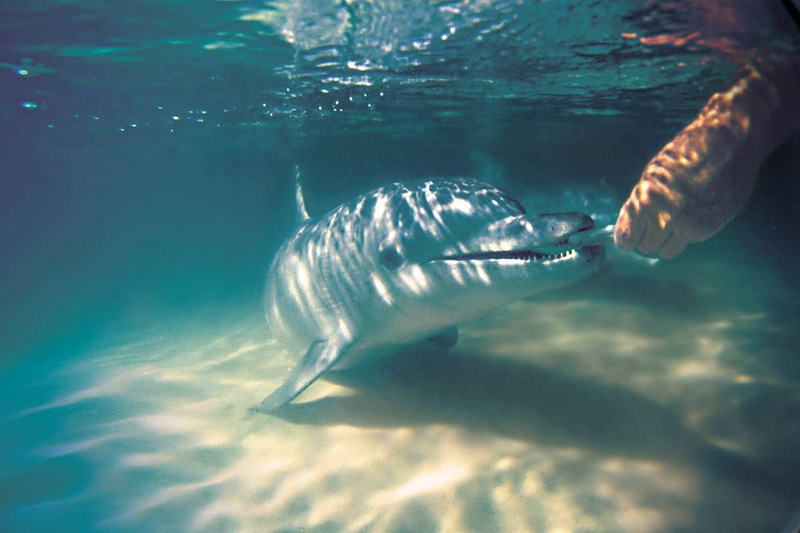 At Tangalooma, you can treat loved ones to an extra-special experience that they’ll never forget – feeding Tangalooma’s sweet-faced wild dolphins at twilight. Automatically included for all guests staying at the resort, wild dolphin feeding is utterly magical and is sure to be a highlight of the festivities! After the confetti has settled, swap the long-haul flight for a few extra days or a week on the island. A great way to unwind post-wedding, staying on for your honeymoon will eliminate the stress of packing and organising travel. 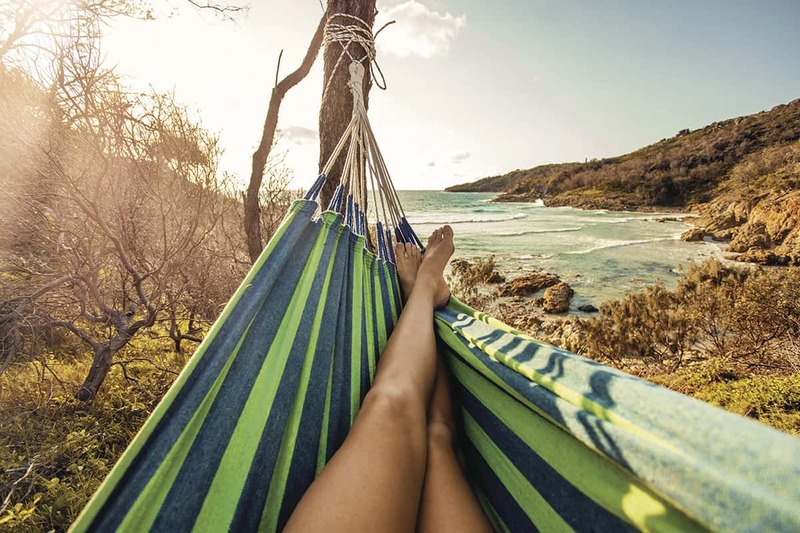 Keep things beautifully simple and enjoy Tangalooma’s beachside hideaways, amazing experiences and rejuvenating spa treatments for a loved-up getaway, minus the hassle. We’ll raise a piña colada to that!